You may have noticed that the KnowledgeLeader team loves a good list. Lists are not only good for organization and clarification in auditing, but they are also great for understanding and communicating how our tools and publications are being received by our subscribers. No list does this better than our annual top 25. 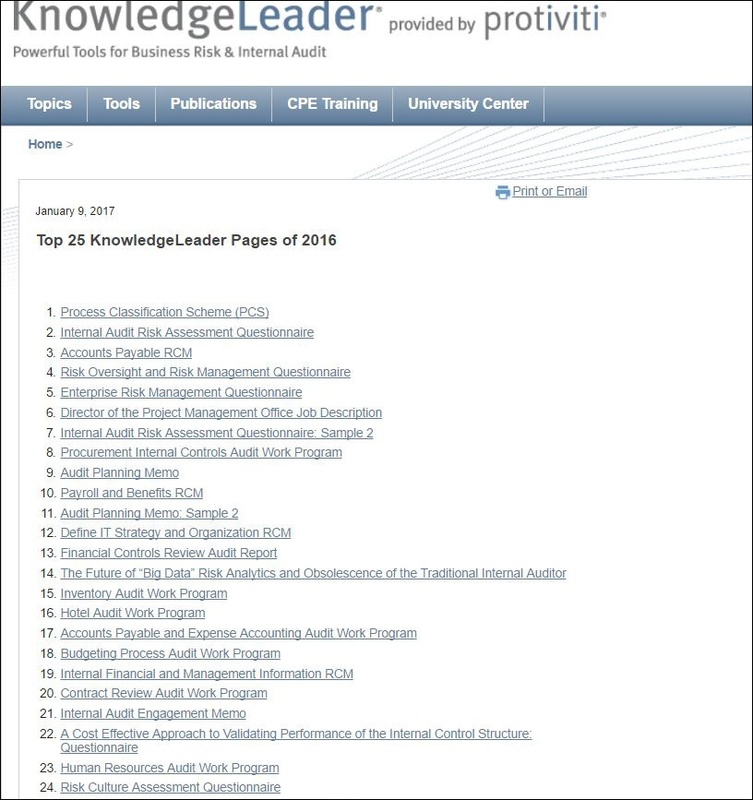 2016 was a big year for updating and adding content on KnowledgeLeader—we published 14 brand-new Risk and Control Matrices (RCMs) and added and updated over 460 audit tools, templates, publications and booklets. If you already have a KnowledgeLeader subscription, of course all of this content (along with the entire KnowledgeLeader database of thousands of tools and publications) is available for download. But if you haven't joined yet, you can view and download everything we published in 2016, including the top 25 below, by signing up for a free 30-day trial subscription, as trial subscriptions have access to the most recent 18 months of content on the site. So if you haven't yet, check out and download the items in our 2016 Top 25; there are some great resources in the list!